Q: What's the deal with all the different types of conditioners at the supermarket, the drug store and the beauty supply store? I mean, I've seen moisturizers, leave-in sprays, detanglers, protein packs, finishing rinses, crème rinses, deep conditioning masks, hot oil treatments, etc. How do I know which one I need? A: That's actually an excellent question, and one that many people fail to ask when it's appropriate. All too often, people get carried away by the marketing hype of a particular product, or they simply grab the first thing they see on the shelf because they don't really understand what they're looking for. Rinse-through Conditioners are finishing rinses or cream rinses that are rinsed out after they are worked through the hair for detangling. This type of conditioner includes the basic conditioner formulas found with their companion shampoo formula by countless brands and makers. Rinse-through conditioners usually have a one-to-three minute application time and primarily affect the outer layer of the hair shaft, smoothing the cuticle and making the hair feel silkier and easier to comb. They are also used to protect the hair from potential damage during heat-styling processes. Rinse-through Conditioners are the most commonly found and - being formulated for oily, normal and dry hair types - are great for use in your regular hair care regimen after shampooing for long-term healthy hair maintenance. Treatment or Repair Conditioners are the more deeply penetrating formulas that are left on the hair from ten to twenty minutes (sometimes being capped and placed under the heat of a dryer to speed penetration). These conditioning formulas often include ingredients to restore proteins and moisture to the hair. Hair moisturizing masques and protein packs fall into this category. Moisture-rich versions of these deep conditioners are especially good for chronically dry hair because of the full penetration of the moisture agents in the product, as well as ingredients to then smooth the cuticle and seal in the moisture that has been added. The high-protein versions of this product are designed to gently swell the hair, allowing it to pass through the cuticle of the hair shaft and replenish the proteins in the cortex, restoring the strength and elasticity of the hair. Protein packs are especially good for use prior to wet set styling to give better, longer-lasting results. Hair treatments and repair conditioners are best used to treat specific hair issues. If you have severely dry hair, a deep conditioner can restore softness and moisture. If your problem is brittle, weak hair, then a high-protein repair conditioner can strengthen and revitalize the damaged hair. These deep-care treatments should be used no more than once a week, and are great in conjunction with your normal rinse-through conditioning agent and even leave-in preparations used for added protection. Leave-In Conditioners are designed for just that - to be applied and left in the hair with no rinsing. They are generally light, moisture-rich formulas designed to prevent dryness and smooth tangles without weighing down the hair. These formulas can be designed for application after shampooing, but before towel-drying the hair, or can be found in spray-on formulas to allow more-controlled application or give extra protection as needed. Leave-in formulas can be particularly useful in situations of combination hair. If you have trouble with dry, fly-away hair caused by daily shampooing, but daily conditioning causes your hair to be flat and appear oily at the scalp, a spray-on leave-in conditioner will allow you to target the ends of the hair where the dryness occurs. 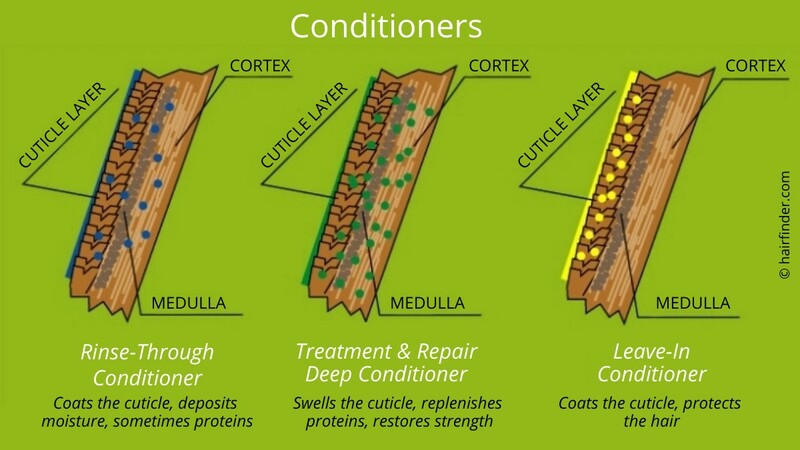 Let's not forget that conditioning treatments are always designed to add to the hair and scalp. There are also toners and astringents designed to remove excess scalp oils and balance out the levels of natural oil in the hair. So, if your problem is very oily hair and scalp, a good astringent and a light spray-on conditioner can be just the combination you need to get the results you want.